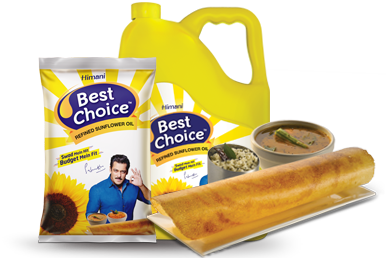 Relish the real taste of purity with Himani Best Choice sunflower oil.The purity of strong bonds and relationships are made stronger when food is sumptuous and full with vitality. Universally accepted and consumed for its light, odourless and clear features, the Sunflower oil is extracted from sunflower seeds and is a rich source of natural antioxidants like Vitamin E. Himani Best Choice Refined Sunflower Oil is transfat free and helps to lower the cholesterol level. This Oil is a highly preferred option for frying edibles due to its high smoking point.